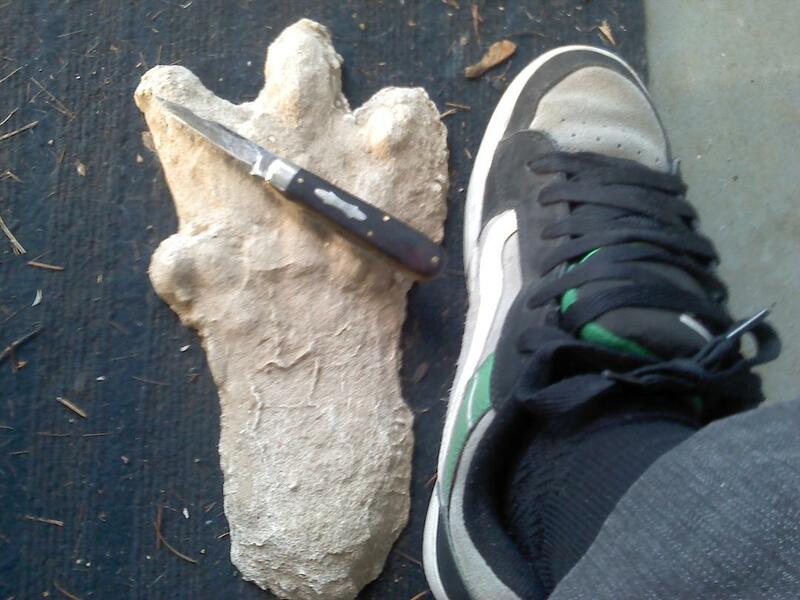 Ghost Hunting Theories: Evidence of Reptilian Humanoids? 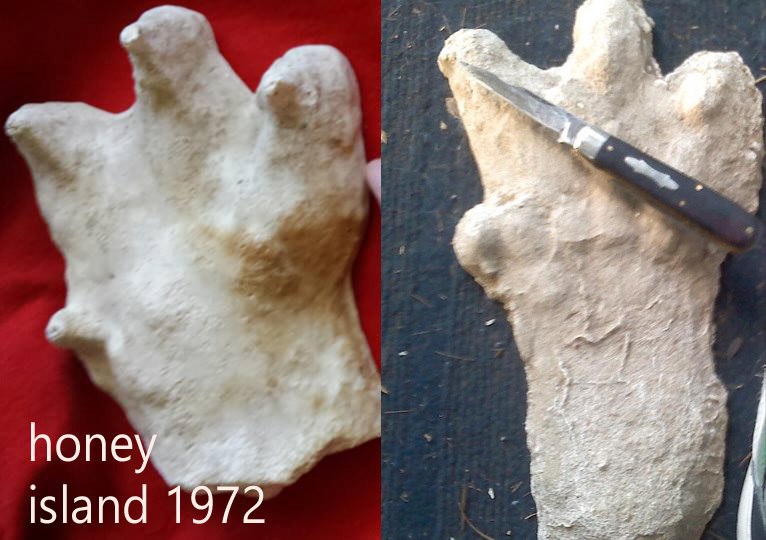 The Honey Island cast is 7-3/4 inches from longest finger/toe to end of cast (but it is broken off, so this foot was bigger). Across the widest pad/palm it is 5-1/2" (my hand is 7 inches long and 3 inches wide). From a Paiute elder (LINK) "’When the world was young, and this valley which is now dry, parched desert, was a lush, hidden harbor of a blue water- sea which stretched from half way up those mountains to the Gulf of California, it is said that the Hav-musuvs came here in huge rowing-ships. They found great caverns in the Panamints, and in them they built one of their cities. At that time California was the island which the Indians of that state told the Spanish it was, and which they marked so on their maps. "’Living in their hidden city, the Hav-musuvs ruled the sea with their fast rowing-ships, trading with far-away peoples and bringing strange goods to the great quays said still to exist in the caverns. "’Then as untold centuries rolled past, the climate began to change. The water in the lake went down until there was no longer a way to the sea. First the way was broken only by the southern mountains, over the tops of which goods could be carried. But as time went by, the water continued to shrink, until the day came when only a dry crust was all that remained of the great blue lake. Then the desert came, and the Fire-God began to walk across Tomesha, The Flaming-Land. "’When the Hav-musuvs could no longer use their great rowing-ships, they began to think of other means to reach the world beyond. I suppose that is how it happened. We know that they began to use flying canoes. At first they were not large, these silvery ships with wings. They moved with a slight whirring sound, and a dipping movement, like an eagle. One article calls the Hav-Masuvs reptilians (LINK). (LINK) The annual "NEVADA AERIAL RESEARCH JOURNAL" for Summer, 1989 confirmed Mr. Steiger's claims by re-printing a UPI news item which appeared in a Berkley, California newspaper. The article stated: "Dale Russell, curator of fossil vertebrates at the National Museums of Canada in Ottawa, has developed a theory that intelligent life forms could have developed from the large reptiles that roamed the earth (in ancient times). "Russell calls his imaginary creature a 'Dinosauroid' which would look like a hairless, green-skinned reptile with a bulging skull, luminous cat-like eyes and three-fingered hands... "
Those last three words caught my attention. 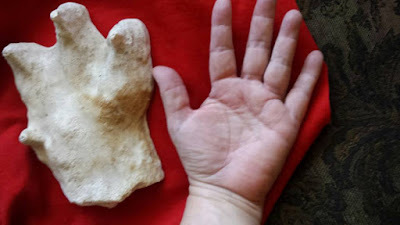 The print from Honey Island (above next to my hand) shows a strange pad on them, much like the thenar eminence beside our thumb, the pad that indicate an opposible thumb. Expect me to work on this some more. 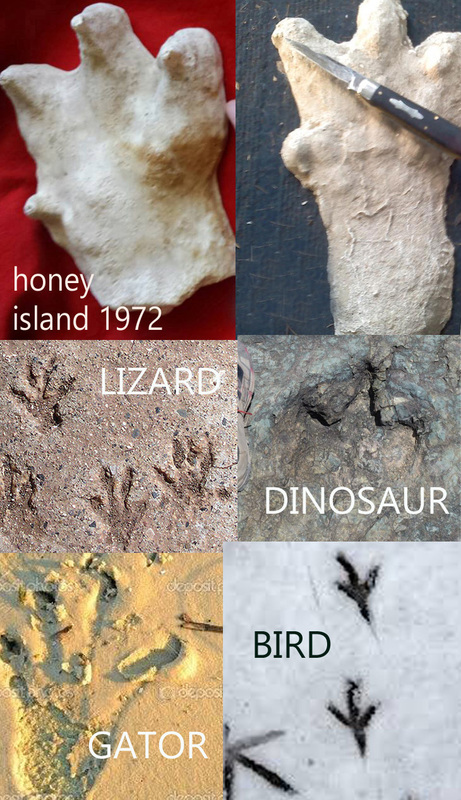 Oddly, if you look at it, the foot/hand has odd, tiny, grape-like round shapes across it and the one from honey island has some ones in the same area.